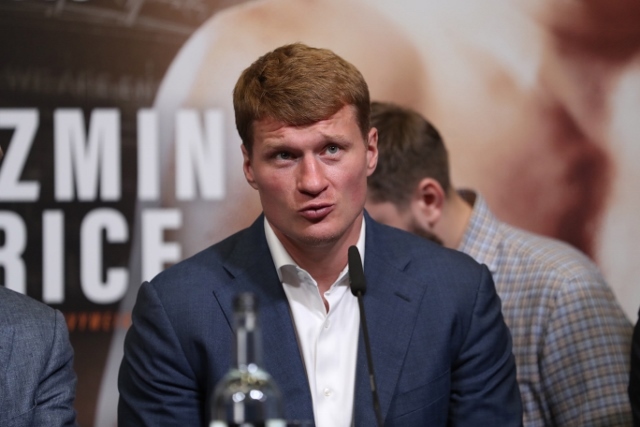 Alexander Povetkin explained why he was interested in a fight with fellow Olympic gold medal winner Oleksandr Usyk, and also admitted that all of the doping allegations have made a long term negative impact on his career. Earlier, on March 28, the World Boxing Association (WBA) ordered negotiations for the bout between Usyk and former IBF and WBA cruiserweight champion Denis Lebedev of Russia, who now has the status of “champion in recess” according to WBA. After this order was issued, Usyk’s team said they were going forward with plans to move up to heavyweight and vacated the WBA crown. A fight between Usyk and Povetkin was being targeted for a date in May. But Usyk’s co-promoter, Eddie Hearn of Matchroom, said the two parties were unable to reach an agreement. Usyk will now face Carlos Takam, who Povetkin knocked out a few years ago. Povetkin states that he is still very interested in facing Usyk. “There was talk of having a fight with Oleksandr Usyk, and then they said that he had other plans. I was not against the fight with him in principle… he is a good, strong boxer. For me, the fight with him is, of course, interesting. Because any time you meet with an Olympic champion [in the ring], you meet with a master pf his craft. We’re in boxing and go to face the strongest opponents, “said Povetkin on Octagon TV. In 2016, Povetkin came under fire when they found residual traces of meldonium in the Russian’s doping test, which is why a planned fight with Deontay Wilder fell apart. At the end of the same year, he tested positive for another banned substance, which led to the cancellation of a bout with Bermane Stiverne. “The story of doping? You can say that it screwed up my career. All of this dirt was not very necessary, it was wrong … In my eyes, usually no one says that they are doping, but I’m not worried I because I known the truth,” said Povetkin.